Judy Melinek, M.D spent two years working and training as a Forensic Pathologist at the New York City Office of the Chief Medical Examiner and Working Stiff is her memoir of this period in her career. Melinek takes us through many real cases, including: accidents, murders, suicides, death from natural causes and more. She worked the sorting tables throughout the September 11 recovery and gives a touching yet harrowing account of the process of finding human remains, cataloguing them and returning them to family; anxiously awaiting news of their loved ones. Working Stiff reads like an intimate conversation with Melinek. Every time I had a question, she answered it, and it felt like she was telling me about her work as we passed the time on a long car trip. I thoroughly enjoyed it. Judy's husband T.J. Mitchell has an English degree from Harvard and is a stay-at-home Dad. Why he's listed as a co-author on Working Stiff is beyond me. Presumably Mitchell read and edited many drafts of Working Stiff for his wife while it was being written, but don't many partners and spouses do this? He even had his own acknowledgements, argh!! 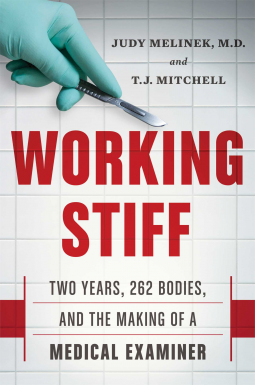 This was a minor sticking point though, and I thoroughly recommend Working Stiff - Two Years, 262 Bodies, and the Making of a Medical Examiner to those who enjoy forensics and are genuinely interested in the work of Medical Examiners. Best memoir of the year for me! Please note: since writing the above review, author Judy Melinek has contacted me to let me know that she gave her husband a journal and he wrote the book, making it a 50/50 effort. I'm grateful for this clarification.